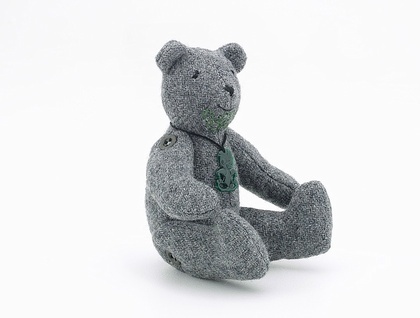 Tiki Teddy is made from a vintage army blanket, he was destined to be a Warrior bear! Because he is handmade and contains small parts ( buttons) he is best suited to children over 3.I use heavy linen thread and surgical knots to attach his buttons so they are pretty much impossible to remove. He is quite fond of sitting on beds ( must be because of his blanket origins). His face is hand embroidered in embroidery floss, and he has his own original moko on his chin as well as a Koru design on his upper arm. 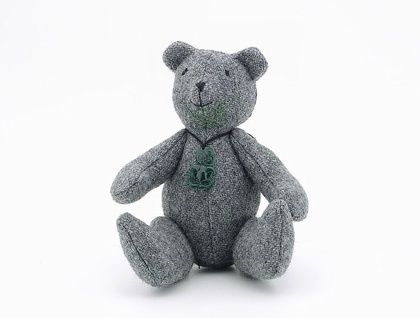 Other tiki teddies are available in different sizes.